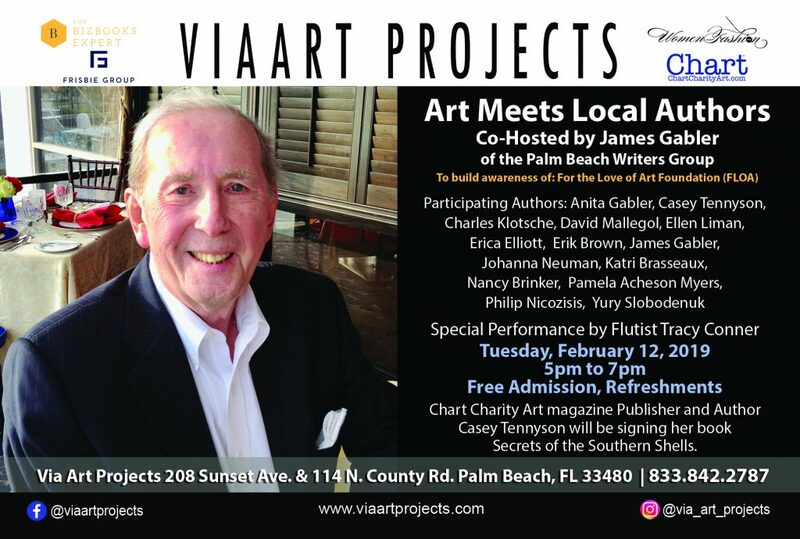 Via Art Projects in Palm Beach, FL invites the public to a special event on Tuesday, February 12, bringing awareness to For The Love of Art Foundation (FLOA). 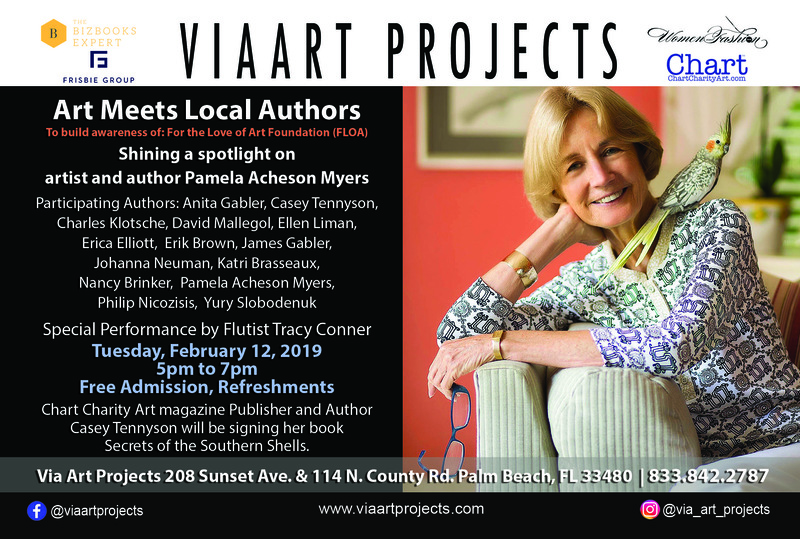 Co-hosted by the Palm Beach Writers Group, you will meet Anita Gabler, Casey Tennyson, Charles Klotsche, David Mallegol, Ellen Liman, Erica Elliott, Erik Brown, James Gabler, Johanna Neuman, Katri Brasseaux, Layla Noor, Nancy Brinker, Pamela Acheson Myers, Philip Nicozisis, and Yury Slobodenuk. Admission is free. 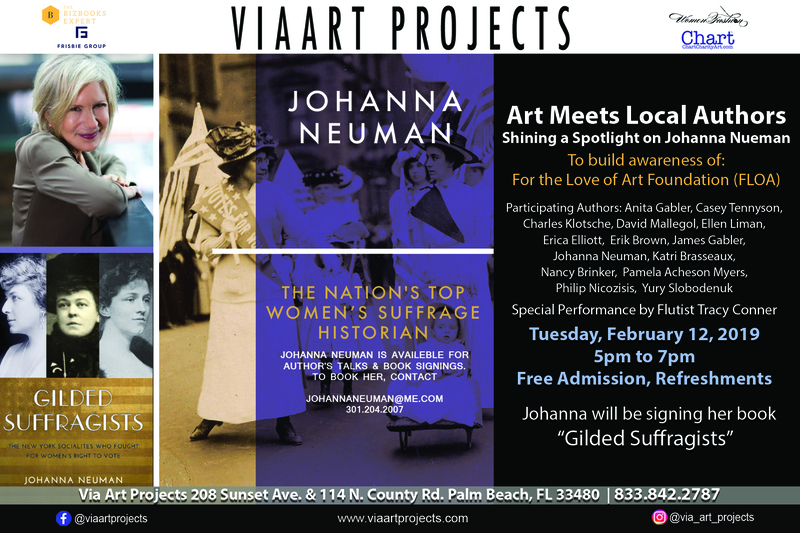 Enjoy the refreshments as you browse this eclectic art space’s artworks and other creative objects. 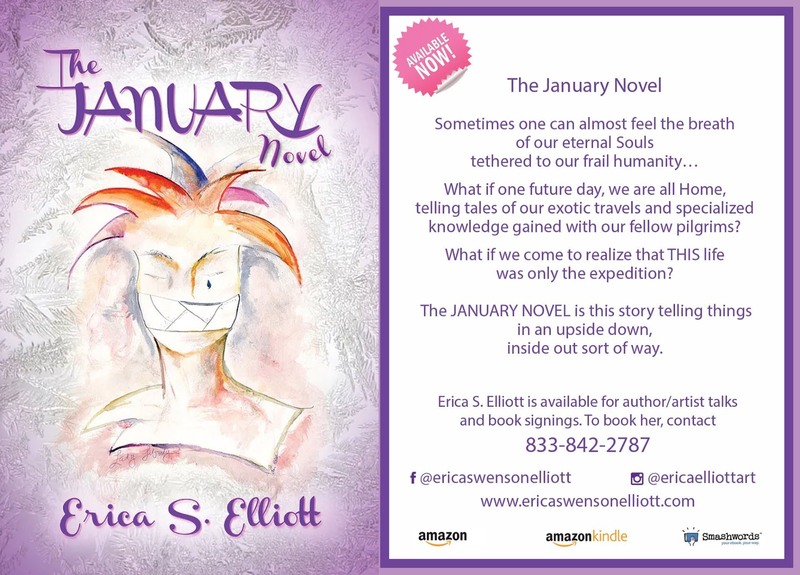 The Rickie Report shares the details here. 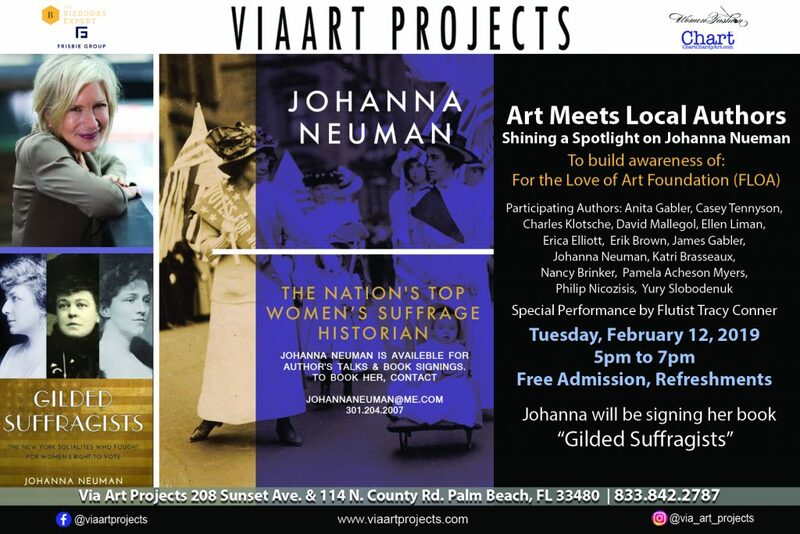 Meet the authors, browse the original artwork, and explore this new art space which celebrates emerging artists! 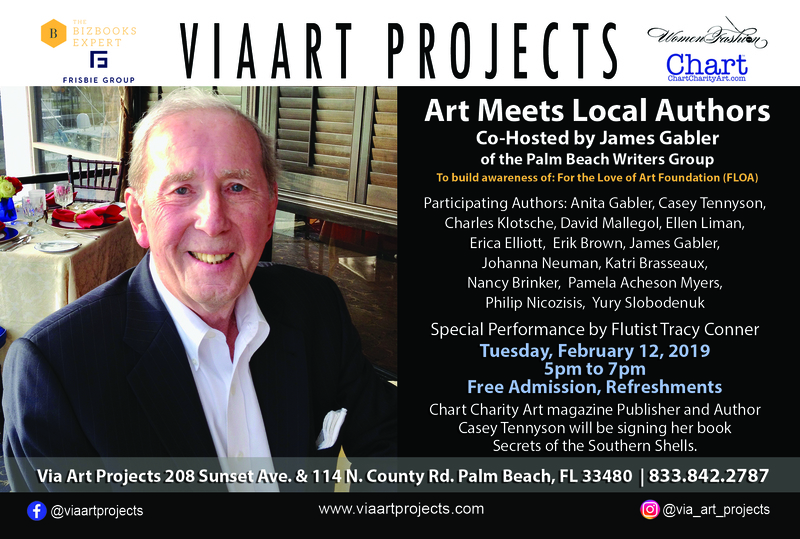 For the Love of Art Foundation (FLOA) supports emerging artists of all ages and walks of life by providing gallery and studio space, canvas, creative guidance, art supplies, and more. These artists are encouraged to continue their work in a welcoming environment through sponsorships by FLOA for those who merit it. FLOA (#83-1334813) is a 501(c)3 Tax Exempt Entity recognized by the IRS for charitable giving purposes. Meet Casey Tennyson, author and innovative charity guru. She will be signing her book, “The Secret of Southern Shells”. Wouldn’t it be clever to match charitable individuals with the arts and see what comes of it? Enter Casey Tennyson and voila! – CHART – Charity Art Magazine is born (ChartCharityArt.com). The publication’s mission is to be a voice for charities and the arts. After ten years of publishing, Casey recently launched an exclusive Palm Beach edition of CHART , featuring “charticles” about local residents, the charities they support and the arts.